LET US SELL YOU A CABIN! 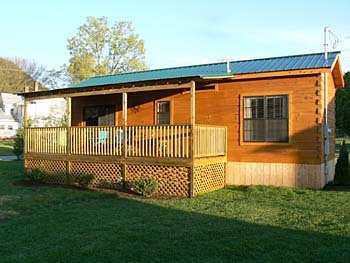 Are you ready for your own personal space… then come by and take a look at our four models located at 127 Imboden Street in Damascus, VA.
Damascus Cabins offers Park Model Log Cabins designed for your personal needs. As an owner you will feel like you are on vacation each time you walk through the door. Base price for cabins begins at $32,800 with lots of options to build your ideal get-a-way. Click on this line to see a page of floor plans. 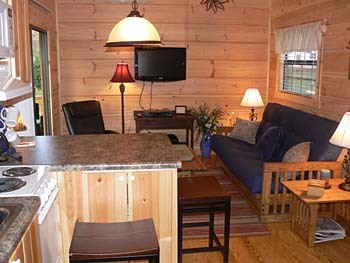 Owner-furnished interior of one of our Park RV models. This is the basic Park RV model as delivered. Features can be added as seen in the example below. This is the basic model with a deck added.